New York’s Metropolitan Opera is in financial trouble, and fingers are pointing to assign blame. 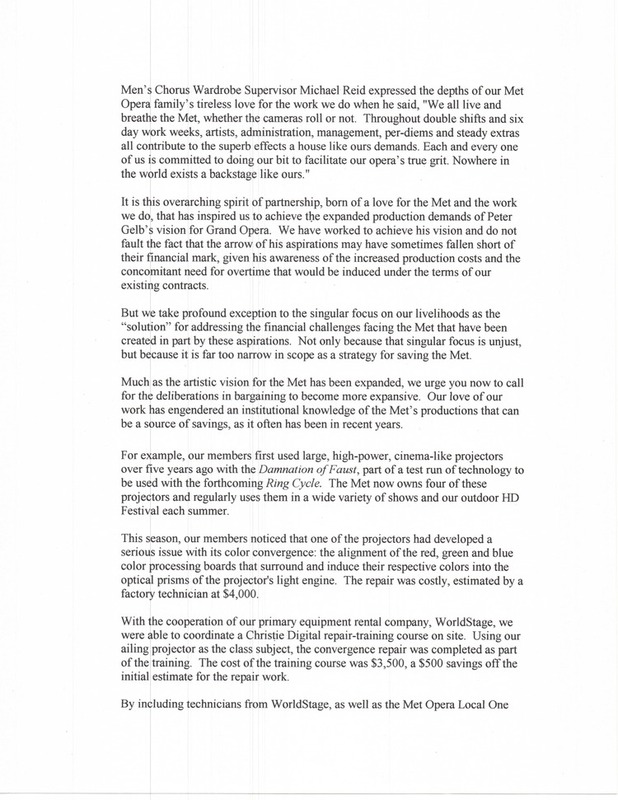 Peter Gelb, the Opera’s General Manager, is seeking pay cuts from several unions, one of which is near and dear to my heart. (Not. Here is the story about how I was personally sued by IATSE – they claimed that as treasurer of IATSE Local 128 I’d stolen hundreds of thousands of dollars, which was either a gross error on their part or a bald-faced lie.) The unions claim the Met’s financial shortfalls are Gelb’s fault, and are requesting participation in the Met’s financial oversight. (Because unions are so good at numbers – see previous parenthetical.) I’ll bet there’s enough fault to go around, including a dwindling audience. The Wall Street Journal reports that the average male chorus member at the Met earns $200,000 per year, which is a pretty damning statistic in itself. That’s right. They love opera – how can we not talk and write about that? I know when I hired a mason to repair my porch a few summers ago, just about all we talked about was how much he loved bricks. Same thing with my plumber – passion incarnate. In my experience, most stagehands prefer shows to working at McDonald’s, but it would be a stretch to say more than a handful of them are lovers of art. They are deeply committed to the perpetuation of their paychecks, and who can blame them? “Ted…Video Projection Specialist…drove to work after learning of his father’s death. He wanted to ensure that his cue for projecting the final title for that night’s performance of Madame Butterfly was covered before he traveled to New Jersey to attend to his father’s wishes at the funeral home. 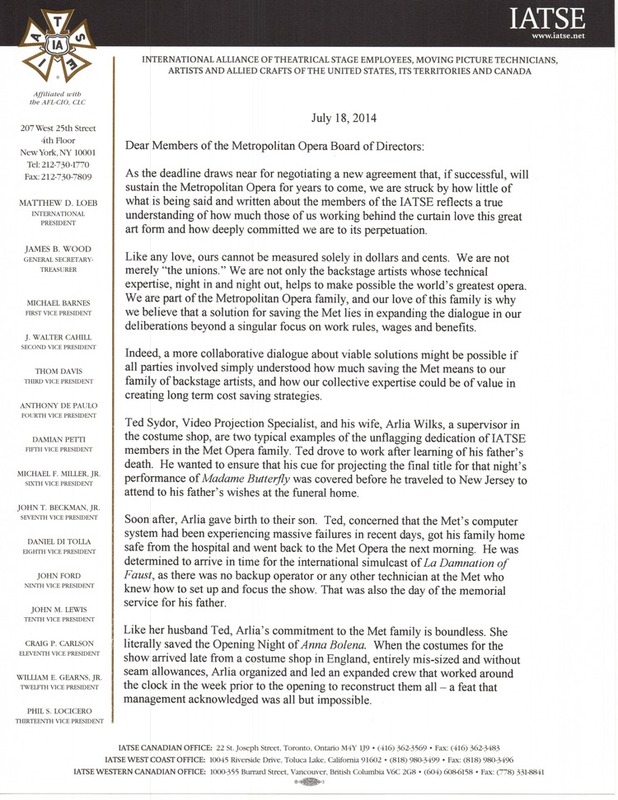 OK. Ted has a lot going on, and Loeb over shared a bit to work on family-friendly sympathies. My takeaway is that Ted didn’t have adequate backup, which is all too common in union and other poorly managed work settings. I’ve known union members who refuse to train others, to protect their own jobs. So, Arlia hired extra workers and they all put in overtime. Loeb doesn’t say this was volunteer work. I’ll bet every person was extremely well compensated. Union work rules often allow overtime pay once a certain number of hours in a given day have been exceeded, and meal penalties are paid if breaks don’t occur at specified times. I have seen base rates more than triple on some shows. So again, from a management perspective, all of those double shifts and long work weeks are driving up the OT. Nowhere in the world can AFFORD a backstage like the Met’s, and it seems the Met can’t anymore, either. “This season, our members noticed that one of the [large, high-power, cinema-like] projectors had developed a serious issue with its color convergence: the alignment of the red, green and blue color processing boards that surround and induce their respective colors into the optical prisms of the projector’s light engine. The repair was costly, estimated by a factory technician at $4,000. “With the cooperation of our primary equipment rental company, WorldStage, we were able to coordinate a Christie Digital repair-training course on site. Using our ailing projector as the class subject, the convergence repair was completed as part of the training. The cost of the training course was $3,500, a $500 savings off the initial estimate for the repair work. Now, this was pretty smart. I have no problem bringing repair knowledge in-house, but Loeb obviously hopes the reader will extrapolate the savings in the example to many future applications. (As an aside, I love the unnecessary, overly technical description of the problem – intended to bewilder and impress.) The Met saved $2,250 on the projector repair, apparently the first such repair needed in five years of use across four of these models. That’s not insignificant savings, assuming the repair estimate by the factory technician was accurate (a big assumption when IATSE is reporting the figure) but this kind of breakage doesn’t seem to be a regular occurrence, either. And if the Met benefits, IATSE gets more from the deal – they received free training and the members who subsequently apply the knowledge will bill for their time. Given that high tech repairs almost always involve replacement parts, the ultimate savings will boil down to the difference between factory and IATSE labor rates. Family values. Dedication. Subjected to a narrow set of demands… Loeb pours it all on at the end, cleverly reiterating his buzzwords and hoping they’ll stick. 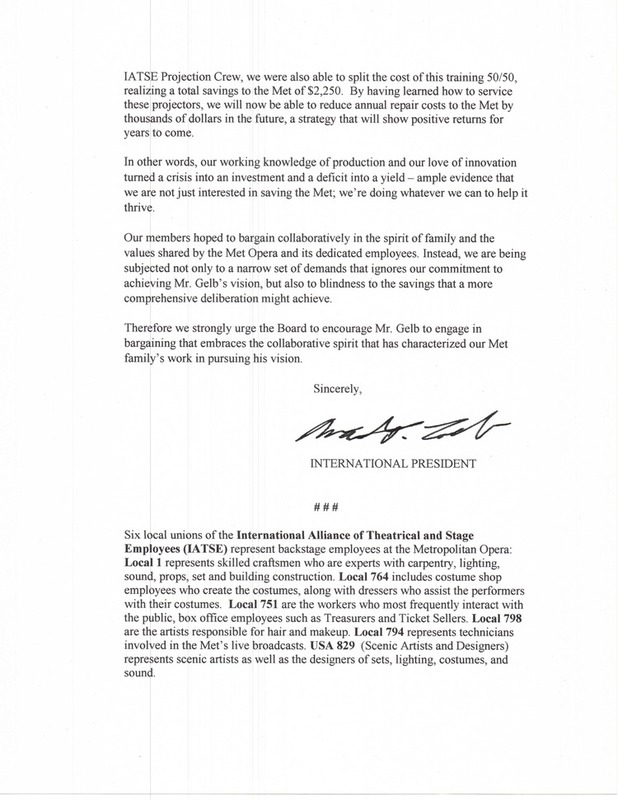 IATSE’s supposed commitment to Mr. Gelb’s vision has been purchased at a very high price, which isn’t mentioned; although, Loeb has pointed out how much overtime his members have put in. But hey, at least they saved the Met $2,250 that one time. Posted in Bits, Theater and tagged Backstage, IATSE, Stagehand, Unions. Bookmark the permalink.